Located a short way along the Shotley peninsula, the village of Chelmondiston is notable for the hamlet of Pin Mill and views across the River Orwell. Rebuilt in the 1860’s, the local parish church of St Andrews lost its tower to a flying bomb in 1944. But it was the Chelmondiston Rectory that was the subject of interest in a Bury & Norwich Post article during November 1890. 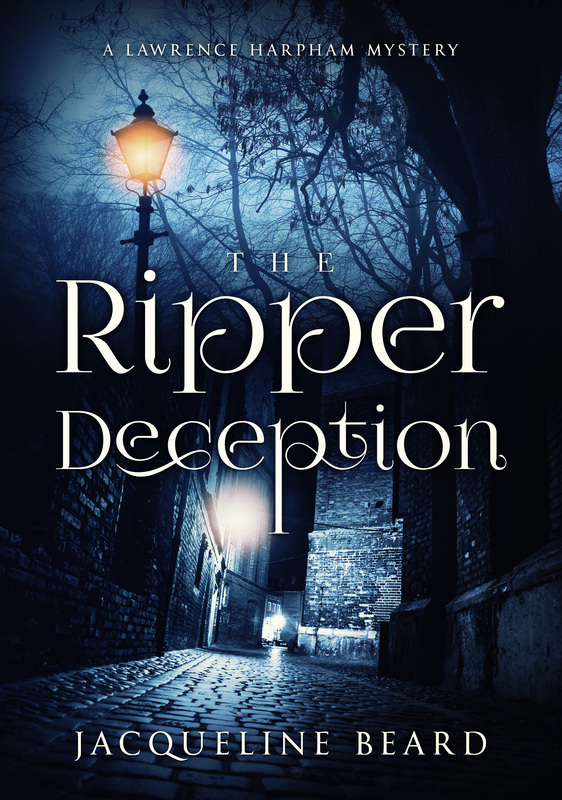 My books are themed, and The Ripper Deception explores the Victorian fascination with spiritualism. Before its conclusion in London, Violet and Lawrence embark on different investigations with Violet arriving in Chelmondiston to find out the cause of strange noises in the Rectory. Her visit coincides with one by a representative of the Society for Psychical Research. I based this part of The Ripper Deception on the Bury & Norwich post article which described the haunting in detail. The Rectory, standing on the left of the road running from Ipswich to Shotley, was built around 1850 and was home to several rectors before the arrival of the Reverend George Woodward and his wife, Alice. The previous Rector, the Reverend Beaumont, had a large family but the Reverend and Mrs Woodward were childless, and the household was considerably quieter. When they first moved to the house, they were unaware of its reputation, but before long they began to hear footfalls in the passages and doors opening and closing in the dead of night. After speaking to the servants, it became apparent that they also witnessed unexplained noises, and one of the maidservants saw the ghost who she described as a small, shabbily-dressed, grey-bearded man. The disturbances continued unabated with the Reverend concerned enough to search every nook and cranny of the house looking for an explanation. He examined drains, removed floorboards and even inspected the ivy on the outside walls, but the noises and sightings continued. The newspaper reported that a member of the Psychical Society arrived to instigate personal inquiries but heard nothing unusual. Neither did several gentlemen of the neighbourhood who also watched at night. Nevertheless, rumours of the ghost spread into the village and reached the ears of the older inhabitants. They still remembered Reverend Beaumont’s predecessor, a certain Reverend Richard Howarth who was Rector of the parish from 1858 until his death from acute bronchitis in 1863. Reverend Haworth was an inveterate miser, so mean that he dressed in rags and only allowed himself half an egg for a meal. He became known as “cabbage” Haworth after promising an ill parishioner a treat and delivering a cabbage. But why would a miserly man of religion haunt the Rectory? Those who remembered Reverend Haworth also recalled the unusual circumstances of his will. Buried in the Chelmondiston churchyard, Howarth was worth about £40,000 when he died, and his will was supposedly found in a pond near the roadside in a book of old sermons wrapped in a piece of cloth. Villagers believed that his troubled spirit still searched the rectory for some hidden portion of his money. The story sounds unlikely, but a quick look at the 1861 census shows the Reverend living at the Rectory with one servant. He died a bachelor on 7th February 1863 and letters of administration granted personal estate and effects to his brother George. So far, so good. However, an article in the Cambridge Independent Press on 23 May 1863 describes a court case resulting when an anonymous letter containing the missing will turned up at the home of his relative James Haworth. The will, drawn up and executed by the Reverend Haworth’s nephew Richard was partly burned and torn. The judge viewed the will with great suspicion, as there was no indication of how it got burned, and whether the damage constituted cancellation. He postponed the case with instructions that it could not proceed without the collection of further evidence. And that’s where my investigation ends. I can’t find any other articles to prove what happened next. However, an 1884 newspaper cutting shows a list of large, unclaimed fortunes, one of which is in the name of Haworth. Mysteriously, the final paragraph of the Bury & Norwich Post article explains the lack of progress in the case stating that the judge who tried the issue died suddenly at the most critical point. This is true – he did. Justice Cresswell died in office on 29 Jul 1863 from complications arising from a fall from his horse. Another week, another slow removal of bricks in the wall of my East Anglian Ancestors. 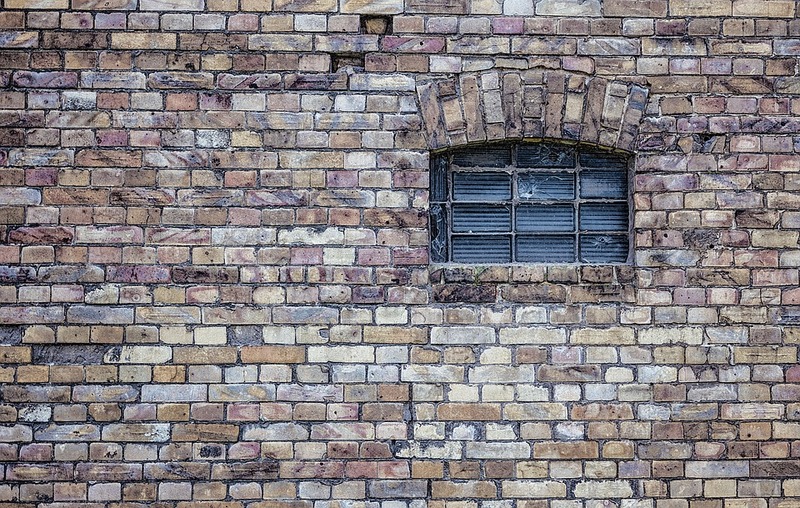 But if I allow myself free rein, without the burden of complete proof and with an eye less on certainty & more on possibility, then a long-standing wall reduces to a heap of rubble. It’s not totally unfounded either. Some facts, some logic & a tiny DNA match suggest I’m on the right track in my search for the origins of my great x3 grandmother, Lydia Whittle. Let me explain. Lydia Whittle, born circa 1808, mostly gave her place of birth as Maldon in Essex and once as Cockfield in Suffolk. I have spent several decades trying to find her in Maldon – not a Whittle in sight, and I assumed that Cockfield was somewhere she might have been in service. A few months ago, I found a strong Whittle DNA match on Ancestry to a family called Hancock. Thomas Hancock married Mary Whittle in St George’s, Hanover Square in 1827. The census confirmed that Mary was born in Maldon in Essex. I researched her descendants & found good DNA matches to the ARROW & BONE families her daughters married into. I was confident that Mary was the sister of Lydia, but no father was named on either of their marriage certificate and there was still no sign of any Whittle births in Maldon. The only clue was a witness on Mary’s marriage certificate named Hannah Whittle, but I couldn’t find a birth or census record for Hannah. I shelved the matter for a few months, too busy, truth be told, writing my new novel, but picked it up again this week. Like my fictional creation, Private Detective Lawrence Harpham, I ferreted away until I found something. Searching through the London marriage records I finally located an entry for Hannah Whittle that looked promising. When I checked the witnesses, there was no doubt. One witness was Jane Whittle and the other was Thomas Hancock, Mary’s husband. Better still, Hannah’s father was named on the marriage certificate. He was called George Whittle. I couldn’t find Hannah on the census, so I went looking for Jane Whittle – and found her. Jane married John Brand in Camberwell in 1850. There were no interesting witnesses this time, but her father was also named as George Whittle. So now I had four sisters, three evidenced as born in Maldon in Essex via census records but still no corresponding baptisms in Maldon. I tried searching for George Whittle to no avail – through Ancestry, through FMP, Free BMD & Family Search. Nothing. Then, just as I was about to give up again, and go back to getting Lawrence out of a particularly tricky situation, I found an entry in the Essex assizes for 1820 – George Whittle alias WALKER was sentenced to death for sheep stealing. I immediately consulted free BMD for Maldon Parish records, and there they were – parish records for Mary, Hannah & Jane Walker born to George Walker & Sarah – no Lydia. And I still haven’t found her, but there’s more. I couldn’t find mention of George in any execution or transportation records, so I looked to see if he was in a census, but I didn’t know how old he was or where he was from. I wondered if there was a logical reason why he might have chosen to take the name Walker and ran a check for Whittles married to Walkers. There was one. Edward Whittle married Mary Walker in Alpheton, Suffolk in 1760 and they settled in Long Melford. A search of the Long Melford parish records revealed a baptism record for George Whittle born 1767. He married Sarah Parish in 1791. The names matched to George and Sarah Walker from Maldon, but their marriage was almost ten years before Mary was born in 1803. However, another search produced a son, George, born to George & Sarah in Long Melford in 1792 and a daughter, Sarah, born Cockfield in 1794. These were undeniably the right parents as Sarah’s maiden name of Parish forms part of the baptismal record. Maldon parish records show one burial record and one marriage record which imply that there may have been children before Mary born 1803, potentially closing the gap between Sarah & Mary. It all sounded promising, but not only was it highly speculative, but George & Sarah Whittle were still alive and dwelling in Cockfield at the time of the 1841 census. Sarah was also in the 1851 census making the theory less certain. First and foremost, George should have been dead given the death sentence that was passed in 1820. Some sheep-stealing death sentences were over-turned, but I would expect him to have been transported, at the very least. Perhaps he was, but I can’t find any record. Is it possible that he left Maldon as George Walker and returned to Cockfield as George Whittle? I’m not entirely convinced but one thing that has swayed me towards this idea. I have never found Lydia Whittle’s baptism – but as I mentioned earlier, she gave Cockfield as her parish of birth in the 1861 census. That makes perfect sense if she was born or brought up in Maldon and returned to Cockfield with her parents. On that basis, I’ve decided to go public with this speculative tree. I’ll be uploading it to Ancestry shortly in the hope of getting better DNA matches in the fullness of time. It’s a win-win anyway. The theory will either stand up to scrutiny or someone will prove it wrong. It’s a gain whichever way you look at it. Corvus corone aka the carrion crow appears throughout ‘The Fressingfield Witch’. In fact, the book was nearly entitled ‘Crowfall.” The crow featured in The Fressingfield Witch was adopted as an unofficial family crest after the Witch Trials and was subsequently used to create terror amongst those of a superstitious nature. Fear and prejudice has long been held against the crow and its poor reputation existed from ancient times. A single crow is considered unlucky and unsurprisingly the collective name for these birds is a ‘murder’ of crows. 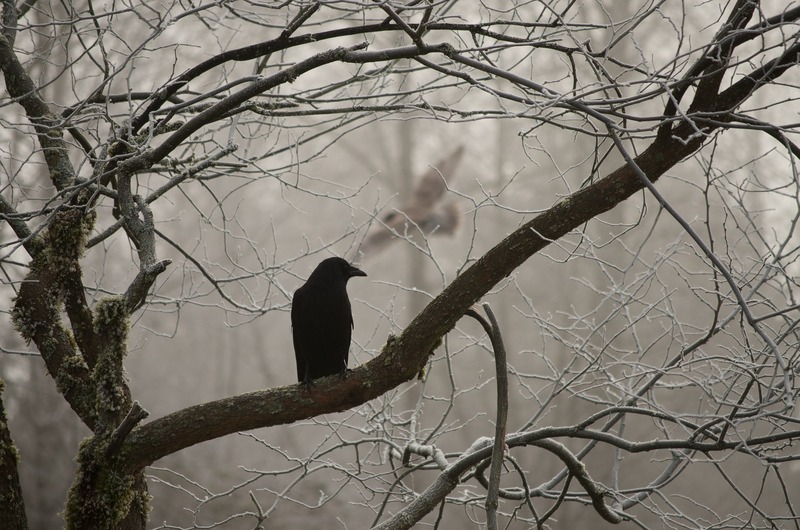 If a crow perches near or circles a house, it foretells a death. If it swoops over the paternal house, it is considered a sign of misfortune. A crow forsaking a flock indicates a famine. Crows are intelligent animals. They remember faces, particularly when they have experienced cruelty. They possess the rare ability to problem solve. Crows are smart enough to drop nuts from great heights to get at the kernel and, in this more modern age, have been seen tossing nuts in front of passing cars to take advantage of an easy nut-cracking facility. The Fressingfield Witch begins with a quote from Hudibas. This 17th century narrative poem by Samuel Butler satirised the Civil War. It also features crows. 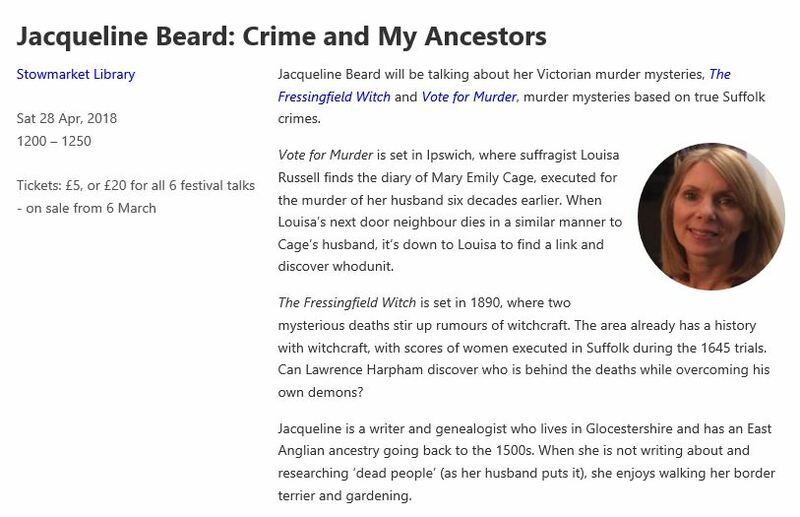 The Fressingfield Witch is my marmite book for genealogists. It’s a good story (though I say so myself), but I’ve used some real historical figures and ordinary folk from the 1891 census. I’m not keen on pigeon-holing books so blended genres get my vote every time, but genealogy is largely based on weeding fact from guess work and the blurring of boundaries may be divisive. There’s something compelling about giving a voice to unknown ancestors. Everyone has heard of Winston Churchill and Jane Austen, while long dead George Corbyn and Elijah Scoggins rest in eternal obscurity. Well, not any more. I would be interested to hear your opinions, though. 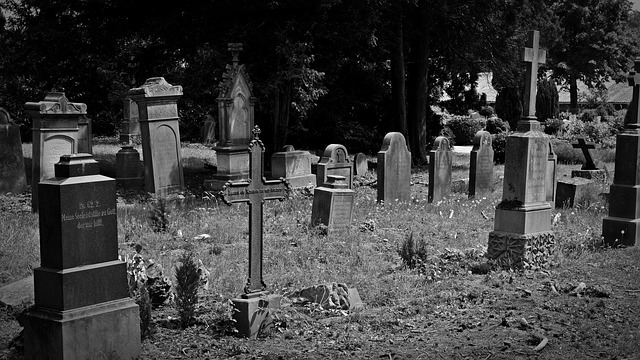 Should ancestors be left to rest in literary peace, or is it reasonable to resurrect them at the risk of second-guessing their personalities? … and it’s here courtesy of Publishnation who have helped me hit my target date of publication by the end of October. 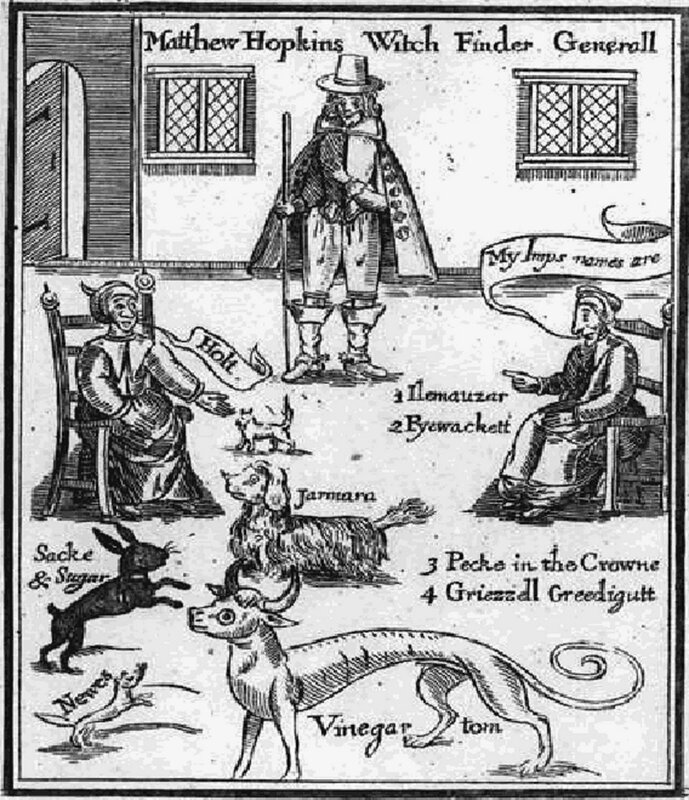 “During the 1645 Suffolk witch trials, hundreds of innocent women were convicted. Death and uncertainty stalked the land. 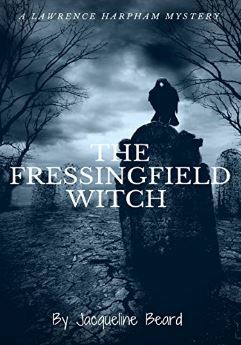 Fast forward to 1890 and two mysterious deaths in the village of Fressingfield stir up rumours of witchcraft again. Lawrence Harpham is dispatched from Bury St Edmunds to investigate. But Lawrence is still tormented by the tragic loss of his family in a house fire. Can he overcome his own demons and discover who is behind the flurry of deaths? It’s the first day of a week away from work. The weather is disgusting. My dog is sullenly pacing round the house eyeing me with disapproval. It’s so foul outside, that today we are going nowhere. I like a walk. It keeps the dog happy and my Fitbit from nagging. 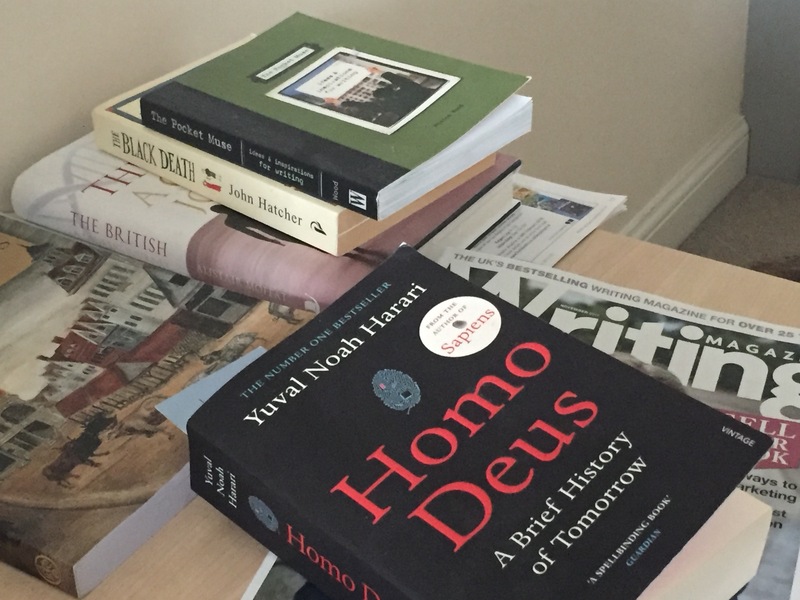 Today my Fitbit sits redundantly on my arm while I contemplate the pile of books I have been looking forward to reading, but have lain gathering dust on my bedside table while other things take priority. The Fressingfield Witch, is one of those other things. 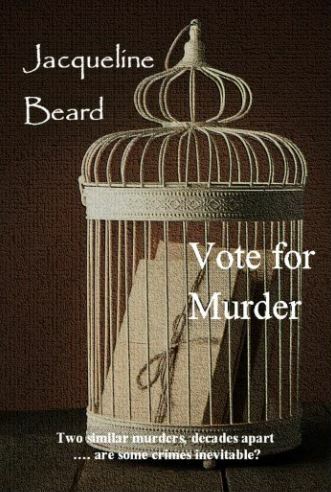 My latest novel is a Victorian murder mystery set in Suffolk and based on a real news item that hit the local headlines in 1890. It was an allegation of witchcraft. The news item was only short, but had an immediate impact on me. For starters, it involved one of my very distant relatives. That’s always a good lure to a genealogist. And it involved death and witchcraft, so my inner writer pricked up her ears. Before I knew it, we had conjured up a novel from this tiny eleven-lined piece of inspiration. I’ve taken a risk with this book. The real village of Fressingfield has been populated with actual people from the 1891 census. This will be like marmite to some. They will either appreciate the idea of real people living on in print, or they will disapprove of the merging together of fact and fiction. I hope it is the former. The final cover and finished drafts are with Publishnation and should be ready for purchase very soon. All of which gives me the rest of the week to catch up with a little light reading of my own. Unless the rain lifts and the dog demands a walk. Doing a little rain dance now….. 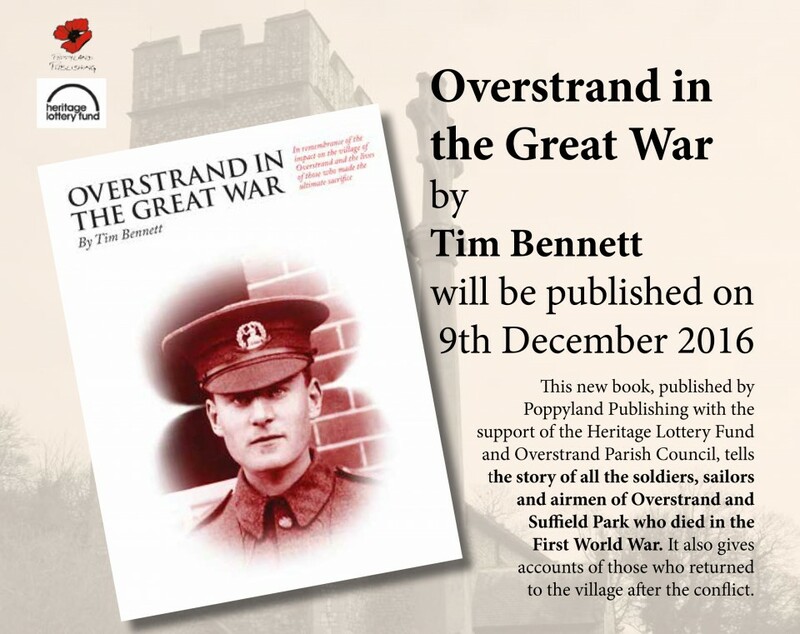 This new book, published by Poppyland Publishing with the support of the Heritage Lottery Fund and Overstrand Parish Council, tells the story of all the soldiers, sailors and airmen of Overstrand and Suffield Park who died in the First World War. It also gives accounts of those who returned to the village after the conflict. With 208 pages & colour throughout, ‘Overstrand in the Great War’ provides a fitting tribute to the young – and sometimes not so young – men and women of Overstrand and Suffield Park from a century ago. General the Lord Dannatt kindly contributes a foreword and puts their sacrifice and service into the context of the continuing commitment required of our armed services. My great grandmother’s first husband died young, but new records from ancestry have revealed how he died. Charles Inman was born in North Anston in 1874. He married my great grandmother, Harriet Herrington, in 1905 but by the time of the 1911 census, she was shown as a widow with 4 young children to support. Early on Saturday morning during driving operations necessary for the installation of a compressed air engine in the more distant workings of the Shireoaks Colliery. 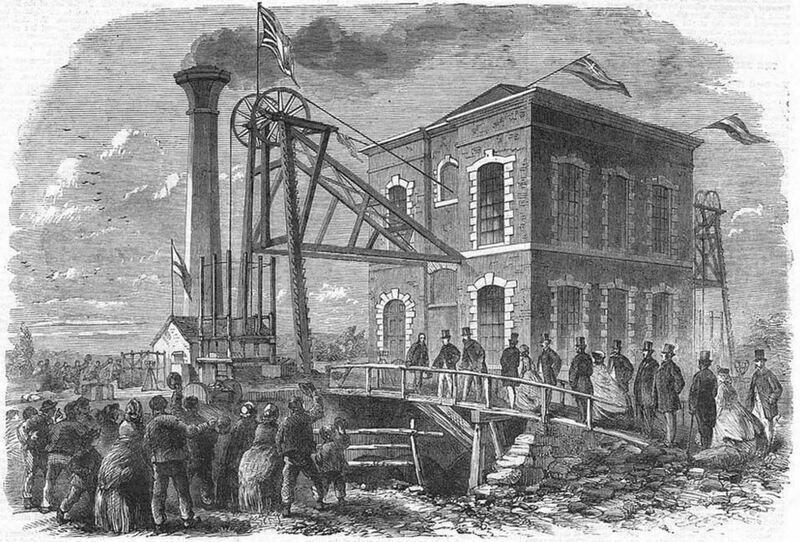 Charles Inman, of Lindrick Dale, was killed. He was engaged in driving a wedge, when, without any warning, a piece of stone, about a tone weight, became dislodged from the roof, and struck him on the head, killing him instantaneously. His fellow workmen escaped injury. Deceased, who was 36 years of age, leaves a widow and four children. Charles was the only fatality at Shireoaks Colliery in 1910 although road maintenance must have been nearly as hazardous as mining itself as there was another fall in the roadway in 1908 that took the life of Thomas Barrowcliffe and a previous accident in 1904 killing Henry Marrison. A subsequent tragedy in 1912 involved my relative, John Cuff, who was also killed in Shireoaks Colliery. John was recorded in the 1911 census as a coal miner hewer working underground in the mines. At the time of the accident his occupation was listed as Stallman. On 27th September 1912 he was walking along the gate road to his stall with 3 other men when he found the roof was ‘biting’ slightly. As he was examining it, a large stone fell from the roof and buried him. Another man suffered a dislocated ankle, but Cuff was the only fatality that year. From the time the colliery was sunk in 1856 to the time it finally closed in 1990, there were 75 fatal accidents. A statistic indicative of the dangerous trade of the coal miner.